24-inch square Large Magnetic Sign. Choose any message and standard color combination for letters and background. We'll email you a layout for your approval before making the sign. 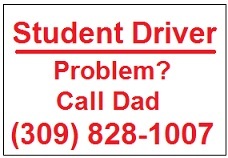 Or, email your design to us at TrafficSigns@aol.com and we'll make your design. Light-weight and durable .30 mil. Attaches firmly to the clean metal door panel of your car or truck and can easily be removed time and again. (Warning: Cold weather may inhibit magnetic grip).